BACKGROUND: Although screening for tobacco use is increasing with electronic health records and standard protocols, other tobacco-control activities, such as referral of patients to cessation resources, is quite low. In the QUIT-PRIMO study, an online referral portal will allow providers to enter smokers' email addresses into the system. Upon returning home, the smokers will receive automated emails providing education about tobacco cessation and encouragement to use the patient smoking cessation website (with interactive tools, educational resources, motivational email messages, secure messaging with a tobacco treatment specialist, and online support group). METHODS: The informatics system will be evaluated in a comparative effectiveness trial of 160 community-based primary care practices, cluster-randomized at the practice level. In the QUIT-PRIMO intervention, patients will be provided a paper information-prescription referral and then "e-referred" to the system. In the comparison group, patients will receive only the paper-based information-prescription referral with the website address. Once patients go to the website, they are subsequently randomized within practices to either a standard patient smoking cessation website or an augmented version with access to a tobacco treatment specialist online, motivational emails, and an online support group. We will compare intervention and control practice participation (referral rates) and patient participation (proportion referred who go to the website). We will then compare the effectiveness of the standard and augmented patient websites. DISCUSSION: Our goal is to evaluate an integrated informatics solution to increase access to web-delivered smoking cessation support. We will analyze the impact of this integrated system in terms of process (provider e-referral and patient login) and patient outcomes (six-month smoking cessation). 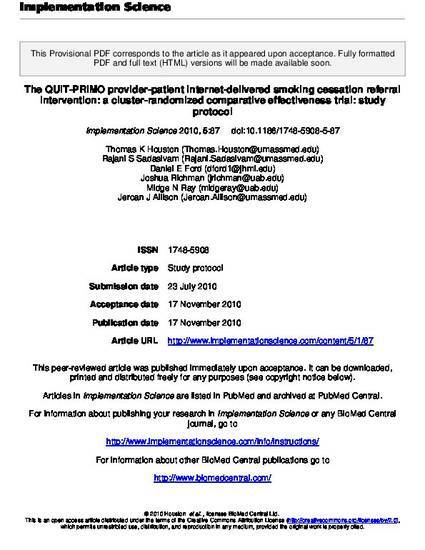 Trial Registration Web-delivered Provider Intervention for Tobacco Control (QUIT-PRIMO) - a randomized controlled trial: NCT00797628. © 2010 Houston et al. , licensee BioMed Central Ltd. This is an open access article distributed under the terms of the Creative Commons Attribution License (http://creativecommons.org/licenses/by/2.0), which permits unrestricted use, distribution, and reproduction in any medium, provided the original work is properly cited. Implement Sci. 2010 Nov 17;5(1):87. Link to article on publisher's site.